On his first day on the job as a Los Angeles narcotics officer, a rookie cop goes on a 24-hour training course with a rogue detective who isn’t what he appears. THE REVIEW: I saw Training Day once before a couple years ago and my overwhelming reaction to watching it again now is how well it holds up. This film is like an intricate puzzle with weird misshapen pieces that are hard to figure out how exactly they fit in. Even if you’ve solved the puzzle before, it is just as fun to do it again because you rediscover how everything fits together. 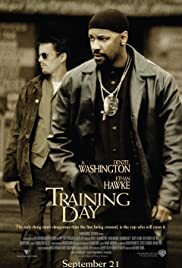 That’s exactly what Training Day is like except with drugs, violence, and a whole lot of tension as Detective Alonzo Harris (Denzel Washington) leads rookie Officer Jake Hoyt (Ethan Hawke) through his first day on the narcotics unit. In some ways, seeing the film for a second time was better than the first. Being able to anticipate certain twists allowed me to direct my attention towards different parts of the frame and story that I missed the first go-round. Some of the surprise was diminished, but it was replaced with appreciation for the small details. Director Antoine Fuqua (who recently reunited with Denzel Washington for The Equalizer, another terrific film) exquisitely crafts a film that will keep you invested from beginning to end, no matter how many times you watch it. Like with a good book that you glean more from every subsequent read, Training Day is the same where every new viewing will bring out something new and exciting. Some parts of the story and specific plot points do raise some eyebrows with regards to logic. Parts are left unanswered or with little explanation that they act like a macguffin, there only to keep the story flowing. If you’re a stickler for these plot holes and a cohesive story that makes sense all the way through, Training Day is not the best film for you. Being the lenient person that I am, I tend to overlook minor grievances if the rest of the film offers enough to distract my attention. Training Day does just that and for me it makes for a film I cannot turn away from because the more I watch, the more it drags me in.